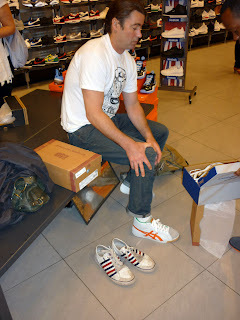 Those of you who have read about my husband here before understand he has shoe issues. 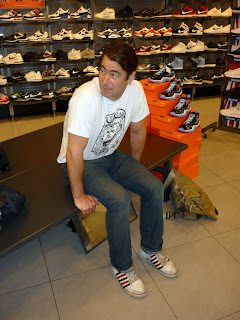 He hates shopping, but wears shoes out like they've been used for swamp dredging. 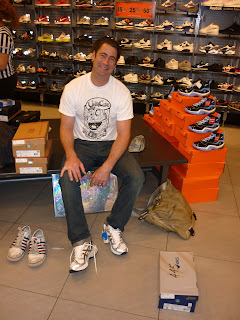 But finally, with some major help from Melissa at Foot Locker, I managed to coerce him into actually entering a store that sells shoes. 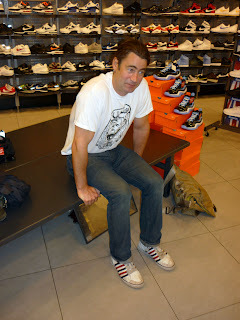 Here are the before shots in Foot Locker on 34th Street: I love the resigned, furtive looks, as if someone (me) is going to make him try on every shoe on the wall behind him. Another innocent succumbs to the power of great shoes. In this case, it's the Asics Gel Kayano. It's the Mercedes-Benz of running shoes. This is the shoe that, at first, was too tight. But after he discovered it was the biggest size available, suddenly it was "fine, it's OK, it feels really good." Oh, we've all so been there. and this hard-to-resist Nike, their lightest running shoe inspired by the elite Kenyan marathoners who train barefoot. That bumblebee Nike was my favorite, purely for looks-sake. 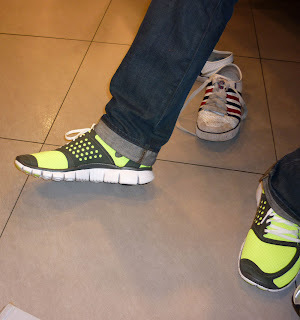 But when it comes to running shoes, my man is a traditionalist and couldn't be torn from the Asics Gel. Give him some options and the man really does feel strongly about shoes. And I couldn't let the artist go home without visiting our district's art supply store, Columbia Omni Corp. 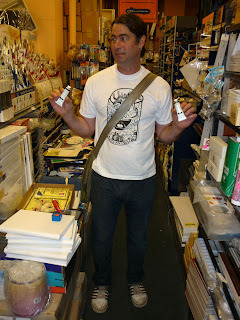 Nothing like shopping for tubes of paint. Please click on the photos so you can see that this store has just about everything stationery-related and otherwise, including a nice selection of Burt's Bees at the checkout. It's like an old-fashioned notions store, and well worth a look around if you're down by 33rd & Fifth and you love aisles packed full of everything under the sun. Update: T-shirt worn by my model is designed by cartoonist Sergio Zuniga. Click here to buy his comics. bumblebee nikes are some sweet kicks! This is adorable. I do love the furtive looks. what the f*&*&K!??!?!?!?!? REPLACED???? IF I find out Melissa even looked at him I am FREAKING OUT!!!!!!!!!!!!!!!!!!!!!!!! 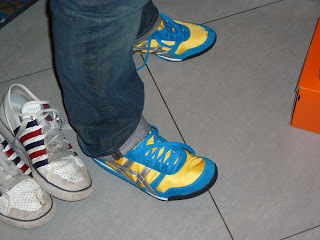 Oh, he succumbed and went for shoes! Whoo-hoo! The paint store looks awesome, we love those places!